June Solar Update | Watts Up With That? We have only 300 years-odd of detailed solar observations with telescopes, half that of magnetic records, half again in the radio spectrum and less than that for most modern instrument records (and 12 years of Watts Up With That to interpret it). So as the months pass our knowledge of solar activity is still growing appreciably. The evidence points to a major transition of activity in 2006 which has returned us to the solar conditions of the 19th century. 19th century-type climate is expected to follow. We now have 70 years of F10.7 data. 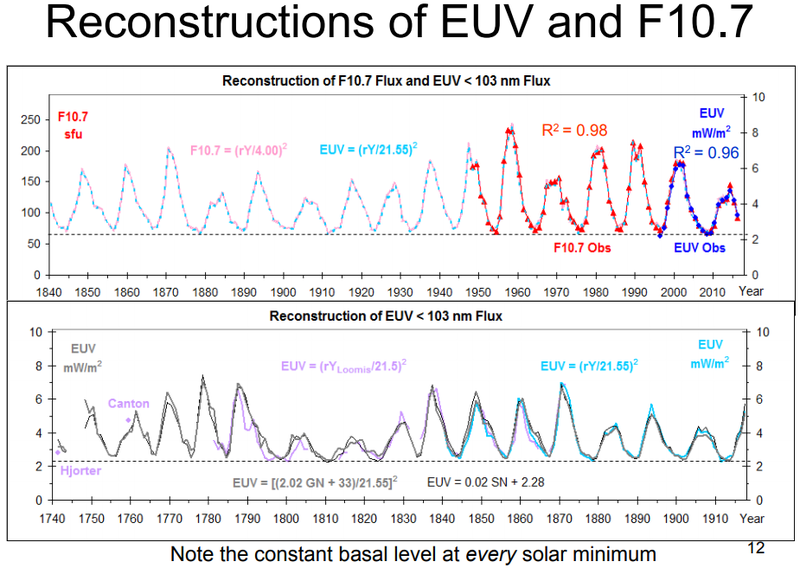 The F10.7 flux is considered to be the most accurate measure of solar activity. The solar cycles are numbered. Solar Cycle 24 has about two years to go before the month of minimum. To date the F10.7 flux has had a floor of 64. The interplanetary magnetic field has been in a downtrend since the early 1980s with the last three solar minima lining up. If this trend continues then it will get down to a monthly average of 2.8 in 2020 at the 24/25 minimum. We now have 150 years of daily aa Index data. This is a geomagnetic index of the Sun’s magnetic activity. 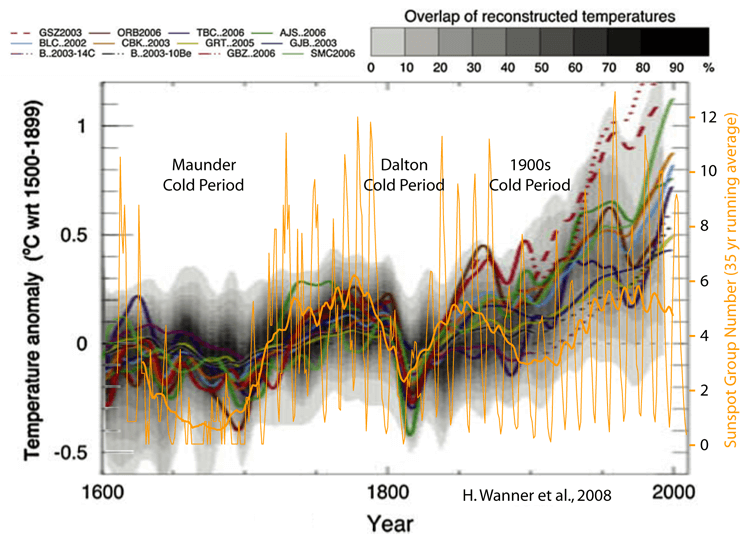 This graph explains why the world warmed in the second half of the 20th century. In the 67 years of data up to 1935, the Sun’s magnetic shield of the Earth averaged 15.7 on the aa Index. In the subsequent 71 years of the Modern Warm Period up to 2006, this shield was 50 per cent stronger, averaging 23.2 on the aa Index. Since 2006, the aa Index has been at Little Ice Age-like levels with an average of 15.8 and falling as we go further into the 24/25 solar minimum. 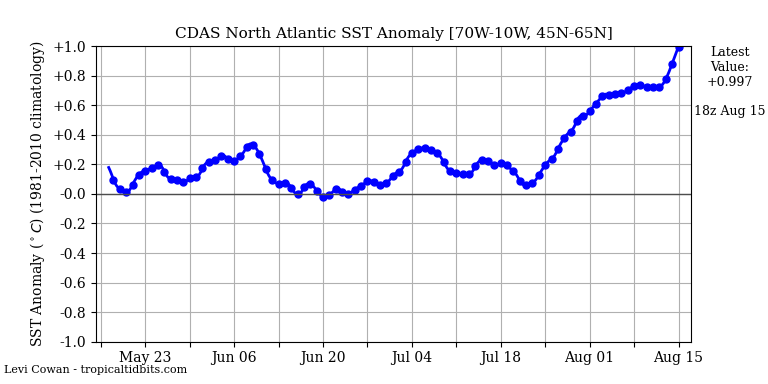 This graph, from Professor Ole Humlum’s climate4you site, shows the Argo temeperature data of the area ccorresponding to the main part of the North Atlantic Current. The Argo floats were launched in 2004, just in time to capture the start of the temperature decline from the end of the Modern Warm Period in 2006. Where the temperature decline will stop is open to conjecture. Another sign that the Sun is quieting down is the alpha particle to proton ratio in the solar wind which peaked in intensity in 1991. This ratio is now at a third of its peak with room for further decline into the 24/25 solar minimum. This graph of the solar wind flow pressure confirms, for the period of the instrument record, the Sun was most active in 1991. Note that the second half of Solar Cycle 24 was far more active than the first half up to 2014, despite the declining F10.7 flux. The 1991 spike in the solar wind flow pressure resulted in a spike down in the cosmic ray flux at the Earth’s orbit as captured by this graph of the neutron flux data from the Oulu station in Finland. That was also the year of the Mt Pinatubo eruption, the cooling from which overwhelmed any solar signal in the temperature record. The neutron flux is where the rubber meets the road in terms of the interaction of solar activity and climate. Cosmic rays are dominantly protons and helium atoms. They hit oxygen and nitrogen atoms in the upper atmosphere and cause a cascade of particles in the lower atmosphere which can be holding enough water for cloud droplet formation but lacks nucleation sites. 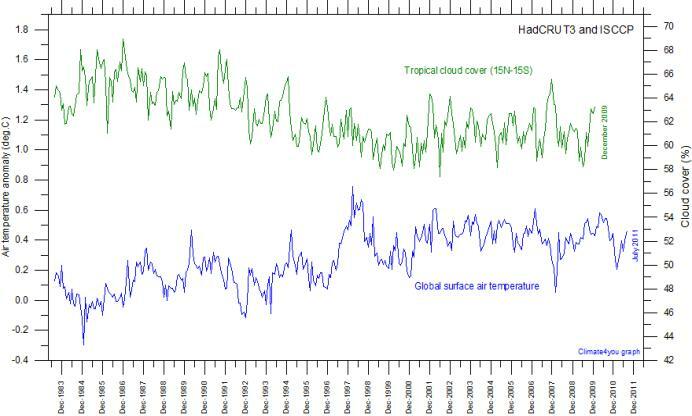 The increased cloud cover during low solar acitivity increases the Earth’s albedo and the atmosphere cools. Despite the solar wind and the aa Index being much stronger in the second half of the current solar cycle, the neutron flux is at a new high relative to previous cycles. The Oulu neutron flux is on track to reach 7,000 during solar minimum. The Oulu neutron flux also illustrated the end of the Modern Warm Period in 2006. This figure shows it inverted against the F10.7 flux. The transition from the Modern Warm Period did not wait for the end of Solar Cycle 23 in 2008, the neutron flux shows an abrupt change to a lower level of activity in 2006. The strength of the next solar cycle can be determined by the solar polar field strength at solar minimum. That is tracking for Solar Cycle 25 to be much the same as the amplitude of Solar Cycle 24. This is a return to the solar conditions that characterised the 19th century. July 6, 2018 in Climate News. “A return to 19th century type climate” … only if we return to 19th century type scientific scrutiny. That was the scientist who thought that the sun was ‘powered’ by combustion! Nothing new to be learned indeed! He also thought we’d burn up all the world’s oxygen within 500 years, burning fuel at the 19th century rate. I’d hate to think what that would mean at today’s rate. Didn’t he date the Earth as being several thousands of years old based on the internal heat of the planet allowing one to literally believe in the Bible? Not knowing about nuclear energy and all. Well, nice to live in the modern era where the science is settled. No. He dated it to be tens of millions of years old, rather than billions. So between the Bible and reality. He said that’s how old it is, unless a new source of heat be discovered. He lived long enough to witness the discovery of radioactivity. Indeed he was in the audience when transmutation of the elements was first used to date a portion of the Earth. Composite graph is here . The SC24 is nearing what might be the start of a prolong minimum (with a possible late start of SC25 too) but even a ‘dead cat bounce’ from these levels appears to be unlikely. “Figure 3: aa Index Monthly Smooted 1868 – 2018” ?? Smoothed ? And the length of the Harvard Bridge is 364.4 Smoots +/- 1 ear. …walked that bridge many times and have refurbished the paint as well. That guy is my, I believe, second/third cousin twice/once removed. The Smoot(e) family is filled with over-achievers, crazy people, and giants… I fit right in. Cousin-ship is defined quite definitely, but not as you have indicated. If you and he have your great grandparent in common, then he is your 2nd cousin (twice removed?). From his point of view though, you could be his 4th cousin (twice removed?). Am I correct that you’re referring to Lord Kelvin? If so, then more likely, for him, you are better described as his great nephew. I trust that this makes the relationships as clear as mud. “Figure 3: aa Index Monthly Smooted 1868 – 2018” I think “smoothed”. But good post. In an age of modern instruments worldwide instead of garbage proxies, we are going to learn if solar cycles have any impact on climate at all. Oh the climate was this or that during the last low therefore it must occur again, is a theory, not a prediction. I would speculate the climate won’t be remotely the same as the 1800’s and this theory is going to drop dead. Is Mild Winter a Sign of Climate Change? Climate change at work? Weather Service calls for third straight mild winter. It’s cold outside. But that doesn’t mean climate change isn’t real. Why climate change may be to blame for dangerous cold blanketing eastern U.S.
Q&A: What does all this snow mean for climate change? I have to admit that yesterday was the first summer like day. My house heater has been on every night so far this “summer”. Been very cool and rainy all of June and bears are still wandering around the lowlands instead of moving up into the mountains. Interesting times here in the Flathead Valley. Southern hemisphere (from friends and family at about 33 deg. south) the same situation. A very cold and long winter. My wife in Chile at about that latitude is suffering, for them, a cold winter. They say that the waves are getting stronger but it doesn’t cool or warm the planet – because the warm parts are getting larger and so are the cool parts. Dan Briggs – the summer ridge has finally reached you. The seasonal turnover has been delayed. By what? It’s probably the shrinking planetary wave number in the big picture. I suspect that it will be quite some time before climate similar to the 1800s is seen again even if solar input remains at 1800s levels. First the world ocean must cool back to 1800s levels, and that could take awhile considering it has over a century of high solar activity warmth input. And 3, 2, 1…..Cue Leif to say otherwise. There is no BS in the article. Just data and opinion on future climate. I guess that is offensive to some. “In this article”. Thats fair enough. Opinion that I do not share. second half of the 20th century aint the future. Predictable I guess that the baseline low would change little, while peak EUV can vary quite a bit. As is evident in your reconstruction, as for instance during the Maunder Minimum. 10 graphs, each showing why temperatures should have been falling and taken together falling hard. But instead they are rising. Anyone find that at all odd? Could it be some other factor is…um, never mind. Well it could be the temperatures are not actually ‘rising’ but the level of data fiddling is….. until you look at the satellite record. The data “fiddling” COOLS THE RECORD. and again I remind you Mosh that the data fiddling is required to cool the record only confirms that it needs to be fiddled cos its literally overheated from UHI effects. The satellite data is not a direct temperature like a thermometer (electronic or conventional fluid type) and needs mathematical processing to turn the raw signal into a temperature. Not all that unusually, when you look at sub sets of surface thermometers where UHI effect has been eliminated by proper siting, the temperature trend is fundamentally different (flatter or even slight cooling depending on the area). Cities can have UHI effects in the 5-10˚ range and even local anomalies close to sensors can provide several degrees of false reading. Dunce. the COOLING happens in the ocean datasets. Mosh If you dont believe in the UAH satellite record, that would be saying that if there ever was CAGW, you believe that Christy and Spencer would be intentionally telling us that everything was all right while the earth would be drowning in rising sea levels and people would be keeling over in the streets from global heat hell. Is that what you expect us to believe ? When the temperatures start to go down in the next 5 years in their satellite record you will be criticizing their data as bunk and instead saying that the fudged land data is the true temperature. Are we skeptics that stupid? science being not settled. However, when UAH makes changes due to deciding to do different adjustments, you all ignore this fact. You ignore what is MEANS in terms of structural uncertainty. Most of you dont even understand structural uncertainty. 2. Their record, Like the RSS record, has been changed dramatically over the years. And not just slight changes but positive to negative changes. Now, RSS try to establish uncertainty ranges by doing ensembles. That is, whenever you decide to adjust you make assumptions: RSS does, UAH does. The next step is to TEST the assumptions by doing sensitivity tests, an ensemble. This tells you the uncertainty DUE TO analyst assumptions. For satellite records they are huge. I can tell you some of the assumptions. Do you know them? No. Similarly in land and ocean record we assess structural uncertainty by have several analysts using differrent data and different methods on the same problem. The structural uncertainty of satellites dwarfs the land and sea record. So its not a question of “not believing’ in them. its a question of Relative strength ALL THINGS CONSIDERED. 3. What do I expect you to do? Nothing. It would be great if you praticed consistency. why would you need to cool the Argo data? Or are you talking about the old data gathered from buckets? Nothing measures temperature directly, not even a glass mercury/alcohol thermometer. Technically correct I suppose but the ‘reading’ you get is temperature not fluid density so its a bloody sight more direct than raw satelite data or even ‘adjusted’ global/regional temperatures. Land warming since 1980 has been twice the ocean warming—and skeptics might claim that this proves that urban warming is real and important. One of the sad side effects of the data doctoring by Zeke and Mosher is that there is a known amount of past energy that they cannot change the records on. Hence their magic wand that takes their land temperature adjustments and shoves it into their historical sea data. One thing to comment on is the amount of interest that warmists develop when challenging articles hit the spot.To see Nick and Mosher, and ATTP over at Judith’s protesting like crazy means they know they are in trouble. Some of the warped logic defending Hansen makes one cry. Whereas the above just makes one laugh. except the corrections wigly suggests are not made. WR: How is the ocean cooled, the SST or the deep ocean? And for what very specific field tested reason? anyone that thinks we have any clue what past ocean temperatures were to the accuracy required for the claims being made is naive in the extreme.zettajoules my arse (please excuse the profanity, i have trouble articulating how stupid some of these notions are). They fiddle-cooled the mid 30s-40s, that’s for sure and heated up the following 40 year cooling period that had scientists worrying about a new ice age at the time. WUWT? They couldnt have a more rapid warming in the record before CO2 could be a factor nor a drop into a frigid cold period with rising CO2. I was born in the late 30s and family and friends talked about this period’s heat for decades afterwards. Moreover I was a newspaper boy in the 50s in Winnipeg and when I went to collect payment for the papers on winter evenings, my mother insisted on walking with me because of the bitterest cold winters in her memory. These have all been egregiously adjusted. There is another factor, it’s called El Nino. just in case it is required.. /sarc! Joe do you dare mock the CO2? EL nino and La Nina cancel. always have, always will, because internal cycles cannot create energy. Thanks for remaining civil and engaged while unfortunately some of the commenters here don’t appear to be able to. “The data “fiddling” COOLS THE RECORD. I’m wondering just how much faith you place in the satellite temp. record? How much of the warming since then do you attribute to humans vs. natural recovery from the LIA and how does one decide? During warm cycles, such as now, there are more Los Ninos. During cool cycles, such as the LIA, there are more Las Ninas. really ? how long have we been measuring the effects of both to the accuracy required to make that claim. A hidden face staring intently through the camouflaging underbrush. Our minds seek patterns to keep us alive. The mind would rather we jump at shadows than miss a predator’s stare. And so we look for patterns and guess at correlations. Constantly seeking and forever worried we might miss something that will spell our doom. That is a heap of data we are collecting from a variety of sources. The monks that tracked sunspots and recorded them gives us a glimpse into a longer range of data. Will the patterns resolve into the face of a predator or will we only find an oddly shaped array of branches and leaves? It gives us something to talk about, if nothing else. For my own opinion, I think we should be building more nuclear power plants and researching other ways of using fission to keep us warm when the weather turns cold. I see solar and wind power as the current generation’s CCW program. It keeps the young adults gainfully employed and does not destroy too much. Brother do you have some U235 to spare? I feel a cold spell coming on. We should be building HELE coal fired power stations and researching the Thorium fuel cycle to bring Liquid Fluoride Thorium Reactors into reality…. The time and money and working lives wasted because of ecofascism and climate regulation in the last 3 decades is a crying shame. Yes, “working lives wasted” says it all. I wonder if we will live to regret this squandering of talent and time. Fortunately, these ugly turbines can be easily removed and used as a scrap metal. I always shudder when I see one, especially nearby. Recently, one of those monstrosities fell under high winds on Highway 25, where I often drive to Colorado Springs. Having the whole “Kansas” part of Colorado to install them where no one would see or hear them, “authorities” decided to show them off along the highway. All this “wind power” scheme is a wasteful show-off at our expense. They are actually difficult and expensive to remove especially the concrete bases and do not forget the lines of pylons and cables strung over the countryside. The offshore windturbines and especially their bases will remain as hazards to marine navigation for centuries. There is no money available for their removal as the subsidy farmers have done what they always do – declared bankruptcy and gone off in search of other subsidies to farm. The ones I have seen are mostly composite stuff, even with rubber sound damping. Less than worthless. The blades may be as well as some of the enclosures, however the main masts are not composite. The main structural supports are more like high tension transmission towers made with steel. I meant the structures – prestressed composite cylinders with a rubber layer likely for sound, not the typical high tension masts. The 50hz noise quite loud even when still. These are typical in Germany and offshore. Blades of course a different composite. There is a great difference between “can” and “will.” This has been attested to many times here at WUWT, by people who have driven by decaying fields of wind turbines. I remember seeing an abandoned installation of wind turbines about 10 years ago at the southernmost tip of the big island of Hawaii. So Stephen is right, their decaying hulks will be around a long time. Smart politicians are not allowed to climb the ladder because they can’t be corrupted. That’s why only the bad apples flood to the top. Actually, “smart politicians” don’t try to climb the ladder since they know the media is only too wiling to invent whatever it takes to destroy them. There need not be a single item of truth in what the media claims, it still somehow is believed no matter how much “fakery” they put out. Pruitt comes to mind. I’m surprised he stayed on as long as he did. Pity about Pruitt, not a politician at all. Still, he should have had 24/7 secret service cover. Trump also not a politician – look at the unrelenting regime-change. Who said real politics was easy? Why choose this temperature record ? I can’t see why the North Atlantic Current would have any special connection to solar activity, compared to any other temperature record. If you look at subsets of the global record, then you must always find a connection. you cant see them until I point them out. I didn’t actually notice that you did, just thought you were blathering. Logically, subsets should even stop cooling in a warming world. All you need is a wind to blow from the cold highs to the warm lows. Happens all the time. See, Mosh, to go with this argument in a warming world, only works for a relatively short time. The relatively cold sets should be warming in an absolute sense. The poles during the Jurassic were “cool” regions but a heck of a lot warmer than now. Even more so during the Cretaceous Period and following Paleocene and Eocene Epochs or the Paleogene. Gary, you get a ‘cold subset’ when the waves intensify and with record breaking speed they bring down the cold from the long Arctic winter. Speed in the storm tracks is the important factor because the air gets modified. Why choose this temperature record ? Probably because it’s the one we have an actual record of. The correlations seem a bit weak between these measures of solar activity and temperature. Unless your talking negative correlation; then they’re quite strong. under the influence of GCR. It is well known that the unique source of charged particles in the lower stratosphere are the GCR, which consist from protons, a-particles and heavier nuclei (Z>3) with energy >1—2 GeV/nuc. ozone formation in the lower stratosphere, because of radiolysis in the oxygen molecules. Ozone and 14CO2 will in winter raise the temperature in the lower stratosphere above the polar circle, which leads to the escape of water vapor to the stratosphere and increase the amount of ozone in the upper troposphere. Therefore, in winter in North America temperatures will be very low. The highest rate of ozone and carbon-14 production takes place at altitudes of 9 to 15 km (30,000 to 49,000 ft) and at high geomagnetic latitudes. Production rates C14 i O3 vary because of changes to the cosmic ray flux caused by the heliospheric modulation (solar wind and solar magnetic field), and due to variations in the Earth’s magnetic field. Stratospheric Intrusions are when stratospheric air dynamically decends into the troposphere and may reach the surface, bringing with it high concentrations of ozone which may be harmful to some people. Stratospheric Intrusions are identified by very low tropopause heights, low heights of the 2 potential vorticity unit (PVU) surface, very low relative and specific humidity concentrations, and high concentrations of ozone. Stratospheric Intrusions commonly follow strong cold fronts and can extend across multiple states. In satellite imagery, Stratospheric Intrusions are identified by very low moisture levels in the water vapor channels (6.2, 6.5, and 6.9 micron). Along with the dry air, Stratospheric Intrusions bring high amounts of ozone into the tropospheric column and possibly near the surface. This may be harmful to some people with breathing impairments. Stratospheric Intrusions are more common in the winter/spring months and are more frequent during La Nina periods. Not by me. Current solar activity is not conductive to significant cooling. Although small ups and downs in temperature should occur, we just entered the Modern Warm Period less than a century ago. By analogy to the Medieval Warm Period we should remain in this period until about 2250 AD when early 20th century temperature might be revisited, and serious cooling could start afterwards. Any strong cooling prediction for the next couple of centuries is very likely to fail. David Archibald already has experience on that. Changes of a few tenths of a degree up or down are irrelevant. Temperature should stabilize ~ +1.5°C above pre-industrial. I expect solar activity to start increasing. Already the present minimum should be less deep than the previous one and SC25 should have more activity than SC24. From then on is back to the Modern Maximum in solar activity. I know this will be a huge disappointment to a lot of folks expecting a new Little Ice Age. The solar wind pressure in 2019 should decrease further. It is enough that in the winter in the northern hemisphere the temperature will drop by 0.5 degrees C.
Its been declining for decades. What level would be? You must observe the temperature of the oceans. It is sufficient now. To keep putting this off is just a vote of no confidence in solar/climate connections. It is not so much a question of declining or increasing. Paleoclimatic records show significant cooling after multidecadal periods with very low solar activity with a delay of a couple of decades. A centennial extended low with just two cycles below average should not produce much cooling. What is very likely to happen is that there will be no net global warming between 2002-2035, and perhaps a slight cooling. That’s bad enough to alarmists, although they should be happy about it. Just call me Rudi. Rudi Zazove. Javier – very interesting and I hope you’re right. A world without ever-warming GHGs. +Javier, as is often the case, you raise some interesting points that cannot be lightly dismissed. However, I have some questions. How can we be confident that the MWP will be a reliable analogue for the current warm period? Perhaps I am mistaken, but it seems to me that the LIA was anomalously long, and perhaps anomalously cool as well, which might signify that some important factor in the equation has changed, perhaps for the remainder of the interglacial. How do we know that we are really living in a prolonged Modern WP and not just a short interlude in the LIA? Currently, not only is a de Vries cycle low expected in solar activity, but archaeologists studying pottery shards in Africa have discovered that earth’s magnetic field was weakening circa 1300 similar to how it is weakening today–although the story I read made no mention of the fact that 1300 was also the approximate onset of the LIA. (It was not “climate” research.) Further, TSI changes clearly have a statistical relationship (the reason is still a subject of debate, of course) with temperature changes, and currently TSI is plunging. Now you may be right that earth’s thermal inertia is so great that even all three of these factors in concert cannot quickly reverse earth’s temperature, but do we really have data sufficiently extensive and accurate that anyone can be strongly confident of that conclusion? Historical accounts have left me thinking that the climate changed rather abruptly at the end of the MWP/MCO. What might be especially enlightening to know is what the climate was doing during the corresponding period to this period in the Eemian. Did the Eemian experience a LIA at a similar point in its run, and, if it did, what happened afterward? Does anyone know? “Following analysis of the data, Professor Lockwood believes solar activity is now falling more rapidly than at any time in the last 10,000 years. Also, TSI has been declining with mean global temperature for about 6000 years now (due to the Milankovitch cycles), so I would suspect that the “background level” TSI tends to be generally lower now than it was circa 1300, and a solar minimum will drive it even lower. How soon will the impact on climate be measurable? The changes in temperature in the US will be clear this winter. ren – yes, the winters in the Eastern US will continue to be harsh I expect. Very mild and dry in the Western US south of the average latitude of the Polar Jet. Meteorologists are studying the mechanisms and they’re not that difficult to follow now, since 2011. The solar conditions in my opinion are sufficiently quiet to cause cooling and year 2018 will be the transitional year. Those who keep putting the solar effects versus the climate off to some time way off in the future I think are just covering for themselves and have a lack of conviction. Already one can see overall sea surface temperatures are trending down and I expect the albedo is starting to increase slightly. My theory in a nut shell is if these two solar conditions are meant which are 10+ years of sub solar activity in general (post 2005) followed by a period of time of very low average value solar parameters which are equal to or greater in degree of magnitude change and duration of time of solar minimum between typical sunspot cycles that cooling will result. Overall low solar equating to lower overall oceanic sea surface temperatures and a slight uptick in albedo the result cooler temperatures. Those that disagree with my assessment do not take into account the solar /explosive volcanic connection or the increase in clouds /galactic cosmic ray connection. Maybe they don’t even think there is a oceanic surface temperature connection ,and last but not least they probably do not realize the geo magnetic field can act in sync or in opposition to solar. When in sync like it is now it will compound given solar effects. So far so good because the trends are down and I say if cooling does not occur now -next few years it is not going to happen for a very long time. AGW theory will live on right or wrong. CERN CLOUD used novel aerosol formation modelling even with access to the proton beam. If you go back to previous solar cycles, you will see El Niño’s and La Niña’s occured at approximately the same times during each cycle since 1964. Just before the cycle minimum there was a weak El Niño and during the transition from one solar cycle to the next is a strong La Niña. This year it appears a weak El Niño is forming so around 2020 or so should be a strong La Niña. The pattern of these are more than random. To me this correlation indicates there is a relationship between solar cycles and global temperature changes as an El Niño or La Niña represents a game changer as far as surface water temperatures that get fed north and south out of the Tropics via currents, as well as influencing the jet streams during winter. We also are currently experiencing a hard temperature drop in the North Atlantic which will further influence global temperatures as there is a lag between the two. Arctic sea ice is holding this melt season and NE Canada has been brutally cold over the start of summer. When La Niña is weak, a wave return below the surface of the Pacific Ocean is too weak. After a weak La Niña, El Niño is not likely create. The graph Figure 2: Interplanetary Magnetic Field 1966 – 2018 looks a bit strange over the period of Cycle 20. The other cycles look like cycles and have a character similar to other data displays such as the 10.7 flux data displayed in Figure 1, but this is not the case for Cycle 20. Is this a data problem? No, the data are good. Geomagnetic activity (the IDV-index) shows the same behavior. This paper argues that the methods used by the establishment climate science community are not fit for purpose and that a new forecasting paradigm should be adopted. Earth’s climate is the result of resonances and beats between various quasi-cyclic processes of varying wavelengths. It is not possible to forecast the future unless we have a good understanding of where the earth is in time in relation to the current phases of those different interacting natural quasi periodicities. Evidence is presented specifying the timing and amplitude of the natural 60+/- year and, more importantly, 1,000 year periodicities (observed emergent behaviors) that are so obvious in the temperature record. Data related to the solar climate driver is discussed and the solar cycle 22 low in the neutron count (high solar activity) in 1991 is identified as a solar activity millennial peak and correlated with the millennial peak -inversion point – in the RSS temperature trend in about 2003. 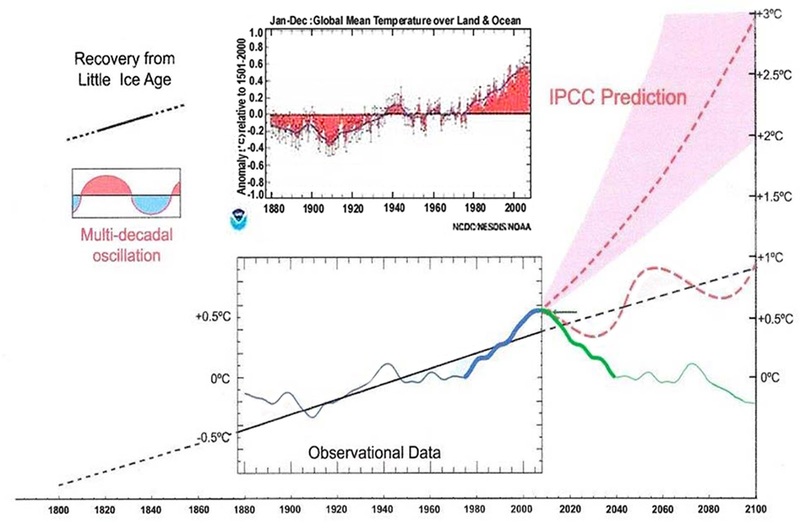 The cyclic trends are projected forward and predict a probable general temperature decline in the coming decades and centuries. Estimates of the timing and amplitude of the coming cooling are made. If the real climate outcomes follow a trend which approaches the near term forecasts of this working hypothesis, the divergence between the IPCC forecasts and those projected by this paper will be so large by 2021 as to make the current, supposedly actionable, level of confidence in the IPCC forecasts untenable. Typo on figure 3. I suspect it should be ‘smoothed’, but I like ‘smooted’ too! Its not just AGW fanatics. There are lots of people that think that the largest input variable has the least impact. Never underestimate the power of Magical Thinking. The Earth is no different than solar energy cells and needs a storage backup facility. Fortunately, it has one. A big one called oceans. As a result looking at squiggles in the solar changes is of little use. Sure, you might see some effect with the bigger squiggles, but you won’t see the big picture. The Earth’s atmosphere’s temperature is primarily driven by heat release from the oceans. Look at the recent El Nino and how the global temperature followed. With this in mind I expect global temperature to maintain the current plateau before dipping with what should be a change into a -AMO in the 2020s. It will then warm up again in the 2040s. I would bet that the recent highs will be seen as the peak of this warm period with the passage of time. Look at what this graph shows of the two previous Warm Periods. Both reach a peak, and then move sideways with slightly decreasing temps after the middle of the trend. I think that is where we are at in this current Modern Warm Period. Goldminor, I agree. I think we have probably reach the peak of the modern warm period but it will still run for another century or two. If we can get good measurements of ocean current speeds we might be able to detect the changes that would signal the end of this warming period. and the heat in the ocean ….. It is the surface oceanic temperatures that matter and they are in a down trend. Salvatore, I haven’t seen any downturn this century, just bumping up and down with ENSO variation. The ENSO trend since the start of this century is pretty much neutral yet the SST trend is warming over the same period. DW Rice, Not even wrong. It really is cute when “scientists” declare that they “know” the temperature of our globe, and oceans. Small minds always tend to believe that they are larger. Steven … if Dr. Gray was right the ocean heat changes are driven by changes in the speed of MOC. Makes a lot of sense and agrees with the data in Thirumalai et al 2018. Earth has been in a long-term cooling trend since the end of the Minoan Warm Period over 3000 years ago, and probably since the Holocene Climatic Optimum, more than 5000 years ago. That trend is still intact. The trends are peaking and will start decreasing, one by one. It takes time. Surely that can’t be right. We are assured constantly by warmist trolls completely rational, objective people that we “should already be cooling”. This video supports my thoughts about solar/climate relationships and where the climate is heading over the next few years. So when are we to cool, again? I say according to my studies and what I have come up with ,is this year is the transitional year to cooler . I have been saying this for a year or so. OK, but many people said the same thing in the early 2000s, and promised that the next decade (after a several year lag, which I assumed to be three years) would show global cooling. That clearly did not happen (about 0.3°C increase since) so goalposts had to be moved. We can only hope that the very small % of change in solar activity will cool the planet we are warming, but odds appear to be that CO2 is far outpacing anything solar irradiance can muster in these short periods. Conversely, we are in for quite a bit of heat if we get hit with more CO2 (will happen, of course) and more solar irradiance. Alley there are lots of variables in play, not least our variable star, but almost certainly a weak El Nino later this year will be followed by a seriously big La Nina and the planet should cool appreciably. Natural variables rule, CO2 has no case to answer. Yes, we have had lists of them for many decades. One of the least, actually. Its variation is very small and cyclical, but as we know solar irradiation is trending down as we warm. 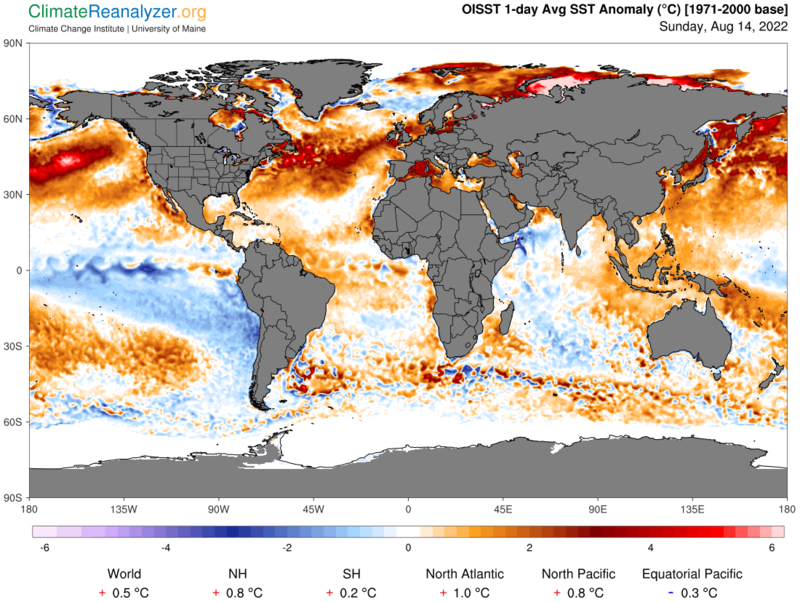 Yes, the oceans are moving the heat around, not creating heat. Link successive El Ninos, and you get a warming trend. Link successive La Ninas, and you get a warming trend. Link all other years, warming. Link them all, warming. Quite the opposite. CO2 is the only forcing that can explain the bulk of the warming. But we also have a cooling stratosphere (indicates an increase in CO2) nights warming faster than days (CO2, not the sun) and the poles warming faster than the average. No other forcing explains these observations. What would be those natural variables? Natural focings only and we would be cooling. Thanks Alley, you maybe right, without a doubt the lukewarm position is looking attractive. Where do you see days getting warmer on average. Nights certainly are warmer in many areas around the globe. Although that has been changing over the last several years where more areas are now experiencing typical average night time temps versus what was seen in prior years. Something is changing in that regard and it is not towards warmer temps. The poles always warm faster during a warm phase of the climate. Cool is on the menu for the next several years due to the ongoing solar minimum. It is what happens after that which will be of interest for those of us observing changes to the climate system. That part comes under the heading of best guesses which is all any of us have to go on. You state that CO2 is clearly the main driver. So how do you explain what the satellites show over the last several years then? How do you explain the last 6 months of sat data showing a very narrow range of change? All of that despite top levels of CO2 continuously being added to the atmosphere. No. CO2-Climate Change is Falsified by its multiple [up to 100%] CO2-Critical Prediction Failures. It takes only one such fail to produce doubt about the validity of an hypothesis. And another, competing hypothesis is not necessary to this Falsification. Until we can explain a 15C rise in a decade in Greenland and large areas of the northern hemisphere without the benefit if increased CO2 (Severinghaus and Brook, 1999), we have no basis for assuming that we have catalogued all the natural forcings. Under the AGW regime the coldest places should warm the most. That isn’t happening in Antarctica, with the only melting happening in West Antarctica because of submarine volcanoes. ironicman – I was told a decade ago that the circulation around Antarctica (700mbs) has intensified cutting off more of the warmth from the north. I don’t know if it’s been confirmed. Not true, the surface winds for a time, mainly from around 2014 to mid 2016, were pushing warm air and surface waters directly into portions of the continent. That pattern started to shift about 16 months ago back to more protective winds and ocean surface flows. temps have been dropping in the center of Antarctica as a result. For over a decade the Klimatariat at BoM have been pushing the line that the subtropical ridge had intensified because of global warming, they knew this was accurate because it happened during the 1940s. They assumed under the AGW theory it would remain intense, but last July the STR collapsed and has remained in that state ever since. So in my book global cooling has begun because the centre of the blocking high pressure is too far south for this time of year. It feels like a rerun of the 1950s and 1960s. +Alley, from where do you get the +0.3C temp rise since AD 2000? Is that from global satellite data or repeatedly adjusted surface station data? Or does it depend on carefully selected starting and ending points? Your claim seems to contradict even Michael Mann, who has finally admitted that the “pause” in global warming is real. Further, only a misanthrope would “hope” for global cooling. Earth has cooled many times, and it has always been hard for man, whereas warming has always made our existence easier. Salvatore, let’s be sincere, you have been predicting cooling since at least 2010. You like predicting and never ever have you predicted warming or no change in temperature. All that tells me is that climate is complicated. Yeah, we knew that. By no means does it mean that CO2, in any way, shape or form is the major, or even minor “control knob”. That is so not true because I based the cooling on two solar conditions which never materialized until this year. I was wrong with my solar prediction but not on the solar /climate connection. I have all the solar parameters I said were necessary for cooling on my website climatebusters.org which was done many years ago. They never came to be until this year. So if this year is transitional and cooling continues after that I will be on pretty firm ground. You can be given a partial pass, but note that you were making statements in 2010 where you insisted the cooling was happening already, and that the next three years would be telling. “Your conclusions are in a word wrong, and that will be proven over the coming years [not sure how many that is, but it’s been 8 so far], as the temperatures of earth will start a more significant decline (which started in year 2002 by the way) [a large increase 2002-2017] due to decrease in solar activity among other items. Those items being (going forward)increasing volcanic activity,cold PDO ,with AMO to follow, SOI index being more positive, along with the atmospheric circulation being more meridional due to low solar activity which produces less UV light which warms the stratosphere in such a way due to ozone changes that produces a more meridional circulation. AO,NAO will in turn be more negative, and polar vortex will expand in size. @ Alley …there is also something you are missing with his comments. Take a look at the first several quotes you posted, and note the sentence structure. Those are not SP’s words. Those are someone else’s thoughts which SP has taken as his own without attribution as to where those words come from. The last several quotes are his words. As his words typically come across as pidgin English. Any time where his comments are stated in fluent English means that he is using someone else’s words, or a mix of different thoughts from a number of people. He never says where those words/thoughts cane from. I took a look. Are you claiming that you wrote the material which is shown there? Always wondered why you write so clearly at times, when at other times you write so poorly. Which one is the real Prete? They are both me. Sometimes I am rushing. Sal ..maybe cut back on the coffee consumption then. Yes. Goldminor I will be reading your future post, always interesting. Except for my comments in  brackets, they are all his. @ Alley …that isn’t what I meant. Yes, he wrote those words, but the words/thoughts came from elsewhere. Mostly Del Prete writes in an unusual style, English not being his first language is likely the reason for that. Other times he sings like a nightingale. When he is singing like a nightingale that indicates that he is using someone else’s words. I noted this years ago with him, and have commented on this aspect of his writing style before. OK. So? He says they are his own words, so we are going to believe him and not you. And even if he pasted someone else’s, he is owning the timeframe. We are past his initial predictions, and are on to new and even tighter (more exciting) predictions that 2018 will be a turning point. Soon we will discover that the turning point itself will take 20 years, since there is no way that solar irradiation will give us the incredible temperature drop that would be needed to outweigh the increase, even if we are using only the past 30 years. The true turning point, if it takes place, will be what happens at the end of this solar minimum around mid 2020. The solar minimum should drop global temps as they normally do. Then we wait and see over the next 3 or 4 years after that if a new step change has taken place leading to higher temps or not. Let’s just keep moving the goalposts and see where that gets you. In the mean time, every single “but it’s the sun” prediction or projection has been wrong, and for several decades. To be fair, climate cooled significantly for about a year and a half during 2008-2009. the end of solar cycle 23. This both perplexed warmists, who had no explanation, and excited some natural cycle theorists, who, in retrospect, were too quick to extrapolate. Further more I will say this which is because my two solar conditions have now been met if cooling does not take place I will be wrong. I do not like the misrepresentation of what I said. @ Javier ….how do you call any of his comments prediction? They are so general in scope, always. He gives no clue as to why he holds his opinions, nor any specific dates of when something will take place according to his so called prediction. Basically, he repeats the same statement over and over again as the years pass. Salvatore observes everything on a regular basis, knows the current solar and climatic data. 10 years for climate change is not much. ren …I am not saying that he doesn’t follow the story. Agreed. 10 years is not much, which is why a transitional year is absurd. Observing solar activity and temps across decades is more telling. He does repeat his same statements, which really are predictions once he writes “the next few years” which was written eight years ago. Now he writes that 2018 will be a transitional year, but it would take decades and a drop in global temps (a real decadal drop, not a hiatus) to show that solar irradiance is trouncing greenhouse gasses. It simply had not been happening for decades now. Alley, I think you have a point here. We are near the cycle low anyway, so only several years into the future will we be able to look back and say whether the end of SC23 was a transitional year, or just an unusually challenging cycle bottom, like 2008-09 was. When do we cool again? Don’t know. The earth has been warming up since the mid 1650’s – without any influence from CO2 – just as it did earlier from the Minoan Optimum Warm Period (MWP) (cold, then back hot again) to the Roman Warm Period (then cold again and back hot) to the Medieval Warming Period (MWP) (then cold again and back hot) to today’s Modern Warming Period (MWP). All pervious cycles experienced long periods of hot but cyclical periods. All previous warm cycles had an extended peak much longer than today’s brief 20-30 years. The (natural) warming trend in EVERY cycle was itself cyclical: up and down over a 66-70 year period, but on the net, always overall positive. Most likely, we will see at least one more short cycle peak before the world begins a catastrophic drop back to the problems of frost and famine in 2350-2550. If CO2 is indeed causing a slight temperature increase, then that increase is the cause of the “pause” (a flattening of the natural increase) rather than an actual decrease as we experienced between 1935-45 and 1975. Note that this 30 year decrease in global average temperatures from their 1935-1945 peak actually occurred as worldwide CO2 levels increased. Note that your much-feared “pause” in global average temperatures occurred as CO2 releases increased by 1/3 their previous amounts. Oh, by the way. For the first time ever, measured sea ice areas in the Sea of Okhotsk, and Bering Sea did NOT melt out completely in August of either 2016 nor August of 2017. 2018 Hudson Bay sea ice is now much much higher than previous 10 year averages. Gulf of St Lawrence sea ice is melting out many weeks longer into the summer than ever recorded before. If sea ice extents at latitude 60 north do in fact mean a cooler planet, we may be seeing that trend develop. Up north? In the central Arctic area? Less sea ice year around means greater heat loss to the infinite cold blackness of space from the exposed Arctic Ocean. During periods of low solar activity, the amount of ozone in the lower stratosphere increases at high geomagnetic latitudes. In the north it is more complicated because there are two geomagnetic centers. The center over Canada causes stratospheric intrusions over North America in the winter. By my count this article has 10 figures, 9 of which are offered without attribution or citation. This makes a difference to me because I like to blog about science topics to a general audience in a way that encourages the reader to examine the evidence for themselves. As it is this article is of little use to me. Your comment is of zero use to anyone here. The above graphs are his own works. He posts attribution as to source of data used to construct his graphs on each graph as can be clearly seen. You must have over looked that. A label such as “Figure 1: F10.7 Flux 1948 to 2018” a) isn’t a citation or reference to the source of the data and b) does little to encourage the reader to examine the evidence for themselves. It’s not even clear that the author constructions his own graphs – cutting and pasting of images being such a common practice. A reference to website which graphs the raw data such climate4you.com or NASA would be preferred. In my opinion this type of article “preaches to the choir” but is not fit, by my standard, for convincing the average citizen indoctrinated by AGW orthodoxy. On your last point there isn’t much that would change the minds of those who believe in AGW, except for a moderate to steep drop over a prolonged period of time. Which is what we are about to see over the next 15 years, imo. Based on our current Milanchovitch-oceanic-atmospheric teleconnected status, I predict we will remain warm and possibly be even warmer. Good. Paleo-investigations clearly show that warm periods benefit all flora and fauna, including humans. Solar variation need not apply. Why? Its metrics so far have shown to be inferior to Milanchovitch cycles interacting with a very dynamic Earth. You seriously believe that solar variation doesn’t affect climate? Remarkable. I assume you’re aware that Milankovitch cycles work on time frames much longer than solar maxima and minima. Do you really imagine that low solar activity during the decades of cool intervals, such as the Maunder and Dalton Minima, and high solar activity during warm decades, such as the peaks of the Medieval WP, is purely coincidental? What is “solar variation”? Pick the F10 (10 cm) signal cited above, a radio wave carrying negligible power. What does this metric tell us about solar variation that is relevant to the net radiation flux into our planet? I think the answer is absolutely nothing, but the people who cite it believe it is a proxy for a solar phenomena that does effect the Earth’s climate. Great. Show me a graph for the causative solar phenomena and temperature! TSI (total solar irradiation) directly changes incoming solar radiation. Since we have been measuring TSI, its variations have been to small to have changed our climate. Sunspots are cooler regions on the sun’s surface that emit more high-energy particles into the solar wind. The TSI increase with sunspot number is about 0.1% (peak to trough) and the variation between cycles is smaller. The only viable hypothesis I know of claims that variation in the solar magnetic field in the vicinity of Earth changes cosmic rays which changes cloudiness. See any clear measures of these phenomena above? Felis asks: “Do you really imagine that low solar activity during the decades of cool intervals, such as the Maunder and Dalton Minima, and high solar activity during warm decades, such as the peaks of the Medieval WP, is purely coincidental? The only records that go back that far are SSN and cosmogenic isotopes. Cycle 59 (1950) was a great decade for sunspots, but a decade of cooling. Leads one ask how important sunspots can be. Is it pure coincidence? Who knows? This is a question for the scientific method. “Gut hypotheses” may feel like real science, but they mean little without experimental testing. Solar leads to cooling when very weak and it is going to do so from year 2018 and beyond. Solar forcing from Milankovic (correct spelling !) cycle is on downturn, don’t expect any warming from there in the next 20-40ky +. There is no “downturn” that can be witnessed by man in a lifetime. 20,000 – 40,000 years between cycles, so those points of turn take at least 100s of years. Anyone who thinks they can see these happening within years or a decade are fooling themselves. Alley I like your approach I think you are fair but let me set the record straight if I could. cooling following x years of sub solar activity in general(changed it shortly after to 10+years). Then it says IF these low solar parameters ARE THE RULE going forward for the remainder of this decade expect global cooling. The problem or reality is the low average value solar parameters that I called for necessary to cause global cooling did not even come close to being realized until very late year 2017.
value solar parameters which I said are necessary for cooling did not come about until late 2017. By the same token now that the two solar conditions I stated are necessary for cooling have arrived that I had called for, I am expecting global cooling with year 2018 being the transitional year and cooling thereafter. I put myself on the line and I also said if it does not happen now I will be WRONG. No excuses. For GOLDMINOR my theory is DIFFERENT from all others in the following ways. 1. I list specific low average value solar parameters necessary for cooling. 2. 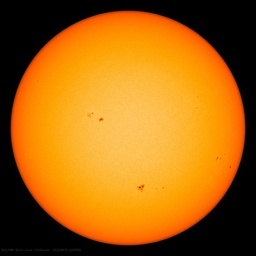 I list number the of years needed for sub solar activity in general necessary for cooling. 3. I am just one of the few that states that when the geo magnetic field is in sync with solar like it is now it will compound given solar effects. 4. I am one of a few that says there is a solar /explosive volcanic connection and a galactic cosmic ray /cloud coverage connection to mention UV light overall oceanic sea surface temperature connection. 5. I have the confidence to say 2018 is a transitional year to cooling. Who else has? I was going by what you had written in 2010. It does matter that you expect 2018 to be the turning point. It would have to cause whiplash and do so soon, because 2018 is shaping up to be another top-5 warm year. Fair enough. You do tend to evolve in this as you do it to some extent. It is kind of hard to stay exactly the same as the years go by. You do learn as you study the subject. That said my main theme is pretty much the same. According to satellite data we are much cooler then a year ago. Dr. Spencer’s data. In addition overall sea surface temperatures are lower and still trending lower. Off around .2c from a year ago. I think the nearest winter in the northern hemisphere will give us an answer as to how low solar activity affects the temperature on the Earth’s surface. ren, nearest Winters are meaningless when the topic is global climate. You are speaking of a season. Even a year is not enough, but much better than what happens when the earth is closer to the sun, and at the same time the largest percent of land mass is tiled away. Makes no sense to look at this cherry pick. Besides, this prediction and others like it have been failing for the past few decades. There already was a cooler year than the last, but only because we set three successive warm records. Watch the man walking the dog, not the dog. 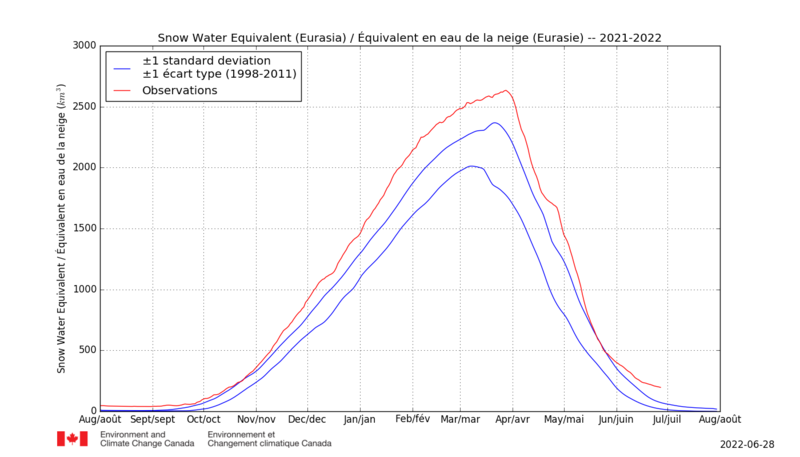 These plots present time series (updated daily) of the current amount of water stored by the seasonal snowpack (cubic km) over (a) Northern Hemisphere land areas (excluding Greenland). Alley, the previous winter, however, distinguished itself in terms of the amount of snow. We’ll know more when we get a few more decades of data. Only in the last 10 years has the polar vortex phenomenon been making news. Higher snow amounts and record-breaking cold in the storm tracks of the Eastern US and Western Europe etc. are expected with a warming planet. On either side of the storm tracks the climate is somewhat warmer and dryer, so the total averages gently trend upward. aligned favorably with the Arctic air, Arctic Jet and Polar Jet and that the warming has so far been slight, so the changes likewise have been slight. Warmer winters have significant environmental and economic implications, and a wide range of research indicates that pests and plant diseases, usually killed back by sharp frosts, are likely to flourish. Top: The total daily contribution to the surface mass balance from the entire ice sheet (blue line, Gt/day). Bottom: The accumulated surface mass balance from September 1st to now (blue line, Gt) and the season 2011-12 (red) which had very high summer melt in Greenland. For comparison, the mean curve from the period 1981-2010 is shown (dark grey). Alley …ren is saying that this next winter should show what effect a solar minimum has on temps. That is a valid point, imo. I expect to see global temps drop below the zero trend line as seen on UAH over the next 2 years as a result of the current solar minimum. SdP …to your #4, I discussed the connection between Iceland volcanoes and other volcanoes and solar back in Sept 2014 when Bárðarbunga erupted. At the time I also posted similar thoughts on an Icelandic blog site only to hear back from some of the Icelandic vulcanologists that they also knew about that. To your #5… I stated back in early 2014 that 2018 would be the beginning of the shift to cooler conditions. Yes we are more or less on the same page. None of us who favor solar and are anti AGW are going to agree on everything, but we are all pretty close when you come right down to it. Vukevic, since Milankovic/Milankovitch was Serbian, is not the only correct spelling rendered in Cyrillic? Perhaps the Croats would spell it Milankovic, but the Latin alphabet is somewhat variable in its pronunciation depending on the language that has adopted it, and other transliterations are just as valid for those languages. Cheers! I´m no expert, just exposing some facts known to me. In the south hemisphere, at about 33 deg. in the year 1975 there was a very cold winter with massive snow fall where there was none in the previous years. It is clear from Fig. 1 that year 1975 was after a weak solar cycle (N° 21). This year, 2018, there was a similar cold winter and I see from Fig. 1 that we are at a similar situation, ie. after a weak solar cycle (N° 24). +Marc, indeed, SC24 has been even weaker than the weak cycle that peaked about 1970. But if warmists admit that a weak cycle has a cooling effect, then they will also have to admit that strong cycles have warming effects, and that would not leave much for CO2 to explain, and thus is dashed their dream of transitioning from national democracy to unaccountable institutions of “global governance” as Al Gore has named it. The only “solar activity” that we are sure can effect the climate is TSI (W/m2). This post doesn’t discuss TSI, but it is generally accepted that observed changes in TSI are about 1 W/m2 (0.25 W/m2 as a solar forcing or about 0.1% and likely too small to be of consequence. The biggest change in TSI occurs at UV wavelengths that are absorbed by the stratosphere. The only other viable hypothesis I know of is that the strength of the sun’s magnetic field shields the Earth from cosmic rays that provide nuclei of cloud condensation and therefore increase the planet’s albedo. In that case, I’d expect to see data on 1) planetary albedo, 2) cosmic rays, and 3) the solar magnetic field. Only the second graph (with units of nanotesla) appears to refer to the solar magnetic field. The aa Index is allegedly a measure of a magnetic field strength, but it appears to be very uncorrelated with the second graph. The remaining graphs are measures of solar activity, but not clearly ones that have anything to do with the strength of the solar magnetic field near the Earth. Some appear to be proxies for the solar wind, but I’m not sure that any mechanism links the solar wind to climate since those particles don’t penetrate to altitudes involved in climate. If any measure is supposed to be a proxy for the solar magnetic field/cosmic rays/albedo hypothesis, it would be nice to see the proxy plotted vs one of these three parameters. With noisy measures of “solar activity”, one can likely find some apparent correlation with climate, but correlations are dubious without a mechanism. You might want to reconsider some of your labels: There might have been a 1950-1975 cool period – but not a “1970’s cooling period” (Figure 2) – that ended in the 1970’s that included solar cycle #19, one of the strongest on record. Likewise, no one I know believes the LIA lasted until 1935 as shown in Figure 3. Although you are correct that the late 20th century warming trend started in 1976, that was initially unclear and those early years (the late 70’s) did not seem to be a lot different from the early seventies. Some of us can remember. There is an interesting aspect of solar data, the Ap and Kp data, which do appear to have a very close relationship with climate variation – short term at least. Be interested if anybody has any useful additions to that data. This goes into it also . The article you sent on AP index and the climate is great. My studies concluded an AP index 5 or less sustained for a period of time will impact the climate in a more obvious way. The lower the AP index the colder the climate. A case can also be made for a very low AP index with isolated spikes being tied to explosive volcanic activity due to galactic cosmic rays bombarding the calderas of these kind of volcanos. There’s an aspect which may invite further study; if overall Ap activity is low, contracting atmospheric structure, concentrating thermal bands equatorward, until an incoming Ap burst causes short term, patchy, expansion in the equatorial belt (effectively the Hadley cell), this will push local surface activity poleward. This may drag equatorial – hot – atmosphere poleward, both giving the impression of warming, where overall cooling may be a more accurate interpretation. Entropic radiation will then dissipate that thermal energy exacerbating the overall geo-heat loss and cooling. Ap interaction with geomagnetic activity may also have its effect in volcanic activity, which may also go some way to explaining the apparent relationship between solar and geo-volcanic behaviour – with its often forecast results. As I have said this year could be the transitional year. Not many are calling for this and so far this year is cooperating. Both overall sea surface temperatures and global temperatures are lower in comparison to last year. One misconception that many have is the climate when it changes does not change slow and gradually. Climate transitions can take place in a decade or less and Ice Core data backs this up time and time again. My two solar conditions are now in and only time is going to show how long and deep this new down trend in global temperature will be. If the down turn continues I will be on very firm ground because I called for the down turn BEFORE it happened in addition to giving the reasons why and how. Of course there will detractors which is always the case . They will be on the outside looking in. That was a song title by Little Anthony and Imperials around 1961 or so. I have about 30,000 records from back then. I am getting off topic. In closing the only thing I care about is being correct. Another day goes by with the oceanic surface temperatures and global temperatures continuing the down trend. Looking good.